Suddenly, three days of life-changing surgeries and care have concluded, and we are finished. We are already planning for the next trip, exploring ways to collaborate to help more children and families. But before we get ahead of ourselves, let’s take a moment to celebrate this year’s work. We are deeply grateful for our partners at St. Andrew’s Children’s Clinic and Hospital CIMA. We continue to be in awe of the passion, dedication and skill of our CSI team. Volunteers are the foundation of work – their skill, passion, flexibility and dedication are what makes this work possible. We are so proud and grateful – Thank you team! Today we finished our work. In total, 62 surgeries were completed. We are so proud to have a strong partnership with Hospital CIMA and St. Andrew’s Children’s Clinic, providing free surgeries to some of the areas most needy families. Our colleagues here care deeply for the children and families of Sonora State and most especially those who have very limited access basic health care. We have a shared goal of providing basic and life-changing medical and surgical care to these children, and, together we work passionately to make it happen. Each child and family has shown us courage, love, determination and hope. Their stories are powerful and moving, and sometimes there’s one that stands out. While on holiday, Ms. Diana, the office manager at St. Andrew’s Clinic, met 6-month-old Vicente’s mother. Vicente’s mother wasn’t exactly on holiday — she was on the street, begging for money. Ms. Diana noticed her carrying a sign and wanted to know more. 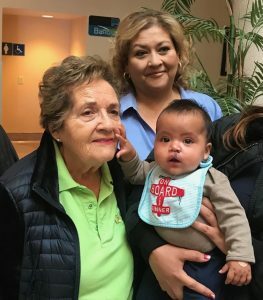 As she approached, Diana realized the woman was begging for money to fund her son’s cleft lip surgery. Ms. Diana knew her organization could help this family, so she talked with the mom and wrote the phone number of St. Andrew’s on her sign, telling her she must call and come to the clinic for evaluation. Mom took a chance and called. The next month Vicente was prescreened for the upcoming fall CSI trip. When our team arrived in Hermosillo, Vicente and his mother were waiting. He had his surgery Monday and went home today, with a beautiful repair and new hope! Vincente’s mom told us how grateful she was. She said she didn’t really think Ms. Diana was for real when they met, but she was wrong. Ms. Diana, St. Andrew’s Children’s Clinic, Hospital CIMA and CSI are very real and very serious about helping families in need. It takes a village, and we are certainly proud to be a part of this one! Today was a long but good day that included 21 life-changing surgeries. The morning started with CSI surgeons reviewing surgical plans with parents, CIMA Hospital and CSI nurses preparing kids for surgery, and CSI anesthesiologists bringing the children to the operating room. 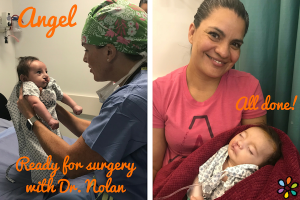 Little Angel, Kael and Santiago were our first cases — all getting cleft lip repairs. Their mothers were so nervous. When children go to surgery their parents have to wait. We wait, we worry, and we wait. It’s excruciating. We assured these young mothers that their children are in incredibly loving and skilled hands. “These are the same doctors and nurses who care for my babies. I have complete confidence in them to care for yours,” I reassured them. While the waiting was hard, before they knew it they were reunited with their children — a little sleepy but overall great. 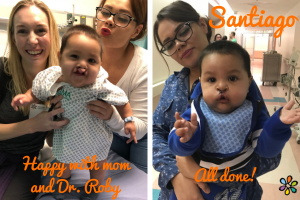 The transformation of the cleft lip after repair is incredible, and moms are so happy and grateful. Some more complex cases were on our schedule today as well, including a four-hour rhinoplasty surgery led by CSI volunteer surgeon Dr. Michael Fritz. After all patients are out of the post-anesthesia care, the team of surgeons, pediatricians and nurses do their final rounds for the day. The last team members departed the hospital at 8 p.m., and 21 patients were resting comfortably in the capable hands of our nursing colleagues at Hospital CIMA. On our first day of surgery, the team completed 20 life-changing surgeries for patients age 2 months to 17 years. 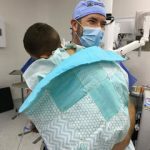 The surgeries that were required, the children’s overall health and their family situations may vary, but some things remain constant — like the love, the worry and the hope for a successful outcome. Today we had a special visit from a former CSI patient, Daniella, who “graduated” from the cleft program after her palate repair in 2016. 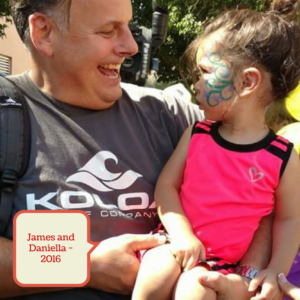 Daniella arrived with a big smile and a gift for longtime nurse anesthetist volunteer Jim Ducharme. Jim and Daniella hugged and exchanged handmade gifts. 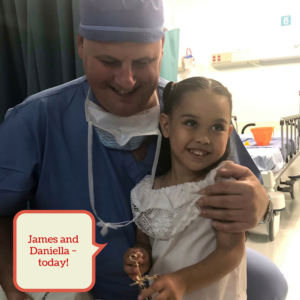 Daniella has decided to become a doctor when she grows up, in part because of the wonderful care she received from CSI volunteers, and she wanted to say thank you to Jim, CSI, CIMA Hermosillo and St. Andrew’s Children’s Clinic. She and her parents are grateful that she can move forward and pursue her dreams, The sky’s the limit, Daniella! Eight-year-old Estrella and her family heard about CSI and traveled one hour through unseasonably wet and cold weather by motorcycle with hopes that they could get help for her cleft palate. Estrella and her family were so tired and scared today. The family lives in a tent in rural Sonora state, and we learned that they have had their fair share of health problems and family tragedy. The CSI cleft team evaluated her and was able to add her to our already busy schedule. We can offer a surgery that we hope will bring joy and happiness, replacing at least some of their fear and anxiety. They are brave to risk so much and to entrust us with Estrella’s care. We won’t let them them down. What an amazing screening day. Our partners at St. Andrews and CIMA Hospital have been working hard all year to prepare for today. They pre-screened hundreds of children to determine which were candidates for surgeries with our team. And today the CSI team, in collaboration with our CIMA Hospital colleagues, screened 110 children for surgery this week. Many were told to return in the future for re-evaluation and checkup; that is one of the unique and special things about this site. For this week, we plan to do 62 surgeries on 57 children in three surgery days. One of those children is 21-month-old Yoel. Yoel will have a palate repair on Saturday; his needs are more complex as he has a tracheostomy and a feeding tube. His mother is beyond grateful that he will be having surgery this week. She was told when Yoel was born that he’d likely not live past 4 months, and here he is at 21 months. He will continue to surprise everyone after his palate repair and more progress. Midway through screening the rest of the CSI team arrived. We were welcomed to the hospital with a wonderful celebration – complete with a band, balloons, songs and many hugs! We are thrilled to be a part of this great community and cannot wait to get to work. After our third and final day of surgery, it’s time to do final rounds, give care instructions to parents, exchange hugs and say farewell to Hermosillo for another year. Most patients spend just one night in the hospital, and after being examined by their surgeon and pediatrician, they are sent home with detailed care instructions and necessary medications. They are also given gifts of food, diapers and toys from the Hospital CIMA volunteers. Most importantly, a detailed plan is made for follow-up and possible subsequent surgeries. This is what makes this trip so unique: When CSI returns to Hermosillo annually, we can follow up on past patients and perform further surgeries as necessary. It’s THIS aspect that can really make the difference for a child to grow up with a normal appearance, normal speech and full self-esteem. CSI depends on support from private donors in order to continue offering this continuum of care. Thank you so much for your support! With your gifts, along with the moral support you offer CSI team members, YOU are changing children’s lives, one smile at a time. Click to make a donation today. 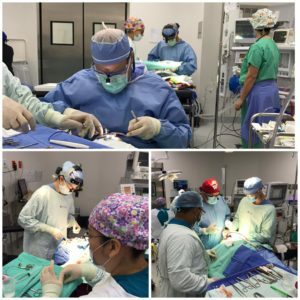 Click for photos from the Hermosillo surgical trip. 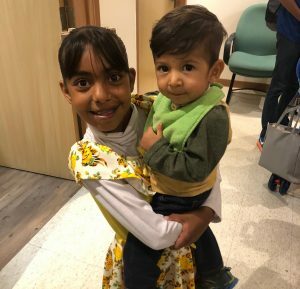 Day Two in Hermosillo brought us 20 more beautiful children ready for surgery: Babies and toddlers needing cleft lip repair, several children in need of cleft palate repair, and four older kids who will undergo surgery to replace missing bone in their palate, using bone taken from the hip. One of the many special patients is Blanca. Since birth, she has already undergone several surgeries to repair cleft lip, cleft palate and more. This year Blanca, now 14, is ready for rhinoplasty, a surgery that will correct the defects to her nose and sinuses. 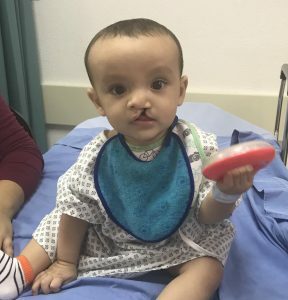 We all know about the dramatic change in appearance that comes from surgery to repair a cleft lip, but the additional surgeries are often critical to the child’s development, speech and self-esteem. A rhinoplasty is often the final surgery a cleft patient will need. In many areas of the world resources may be severely limited for more complex surgical procedures, making this type of ongoing, and often more complicated, care impossible. This is where CSI steps in, partnering with St. Andrew’s Children’s Clinic and Hospital CIMA Hermosillo, providing free surgical and medical care to children in great need. In December, Blanca will have her Quinceañera, the Hispanic tradition of celebrating a young girl’s coming of age on her 15th birthday. It’s an incredibly special time for a girl, her family and friends. There is a special church service, receptions and parties, all to honor and celebrate this important turning point in a girl’s life. Dr. Michael Fritz performed the successful rhinoplasty for Blanca, and the day after surgery she and her mother were all smiles. She is now at another turning point: the likely completion of all necessary surgeries, ready to get on with her life. We are so glad to have been a part of this process for this sweet girl. Feliz Quinceañera, Blanca! View photos from the CSI surgical trip here. Day One of CSI Hermosillo 2017 trip is in the books, with 20 beautiful children receiving cleft lip and palate surgeries. There are so many stories of love — along with fear, worry, sadness and ultimately hope. We are especially moved by the story of one 4-year old boy, Brayan. Brayan and his family are members of the Yaqui tribe of indigenous people in Sonora. The Yaqui are very private. They speak their own language, have their own cultural traditions and live in their own communities apart from most of Mexican society. But when Brayan’s aunt, who is the only member of his family who speaks Spanish, by chance heard about the “Rostros Felices” mission, she took the unusual step of reaching out for help. Brayan was born with both a cleft lip and palate. Because of his appearance and speech patterns, he has been bullied mercilessly by other children and has suffered emotionally and mentally as a result. Brayan arrived at the hospital after traveling with his mother and aunt by bus from their home nearly five hours away. You could see both hope and wary distrust in the women’s faces as they approached us to register him at the hospital. After waiting all day, Brayan was approved for repair of both his cleft lip and palate. On Sunday, Dr. Brianne Roby performed the surgery. She says he came through it like a champ, and everything went very well. After the procedure, and just one night in the hospital, Brayan has a new appearance. He smiled shyly at us from behind his mother’s skirt before beginning the journey back home this afternoon. The volunteers from CIMA tell us that they will continue to work with Brayan and his family to assist him with further developmental needs. We are so grateful for the chance to be part of a team of people helping this young Yaqui boy look forward to a normal childhood. It’s days like this that remind us: We really are making a lasting impact. The first two photos below show Brayan before and after his surgery. Click here for more photos from the day. Day Two is here, with 20 more surgeries coming up! After many long hours of travel, the CSI team has all arrived in Hermosillo. We had a very busy day Saturday, screening 126 children at CIMA Hospital. 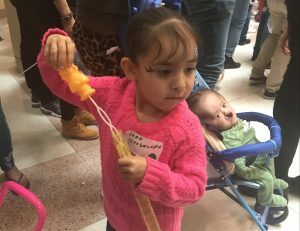 The word has really gotten out about “Rosotros Felices,” and families came from all over the Mexican state of Sonora, many desperately hoping for help for their child. The words “controlled chaos” get used quite a bit! To the credit of our team, the volunteers from CIMA, and the staff from St. Andrews Clinic, however, the experience was much more “controlled” than “chaos.” At the end of the day, after seeing all 126 kids, the surgery schedule for the week was created: 64 surgeries will be performed on 56 children (a few children need multiple procedures). You might wonder, “What about all those other kids who won’t get surgery?” While there are always a few children who just aren’t ready for surgery this year, the majority of those not receiving surgery were here so that the CSI surgeons could evaluate their progress and make recommendations for speech therapy or future surgical procedures. This aspect of the mission is very similar to a traditional clinic, and is pretty unique. 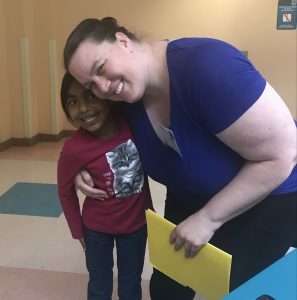 We are so grateful to see kids year after year and follow their progress! 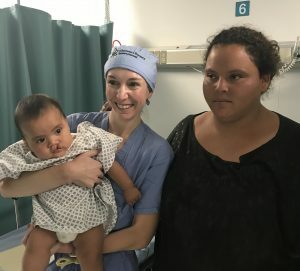 Ana Karen has undergone eight surgeries since birth, and today at screening was given the joyful news that she has “graduated” from the CSI program. Her mother spoke tearfully about the great care she has received, and how her life has changed so dramatically because of it. Here she is, surrounded by our surgeons. (see Ana Karen in “photos” link below). Another “graduate” is Perla, who returned for screening day this year as a volunteer and to help with kids. She also came back to say hello to us, and brought us all cupcakes and lots of hugs! 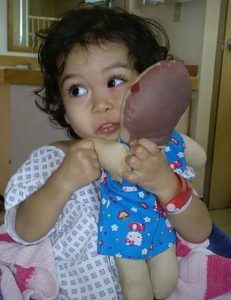 Perla was very young when she first came to St Andrews Children’s Clinic. She had been born with a double cleft lip. Perla was being bullied at school over her appearance, and was shy, scared and withdrawn. Now, years later, she is outgoing, assertive, and smiling all the time. Perla is currently in college and excited about her future! We are so very excited for her, and grateful to all of you who support CSI’s work. making her smile possible! (see Perla in “photos” link below). We are so grateful to back here with our friends from St. Andrews and from CIMA Hospital, and most of all, surrounded by so many beautiful children whose lives will be changed with surgery. We are in process of completing 20 surgeries today! Click photos to view some precious images from the first day. Stay tuned to hear more stories of hope and lives changed. As CSI surgical mission volunteers, we are so fortunate to meet many wonderful children and families. I wish we could share all our stories, but here are just a few. 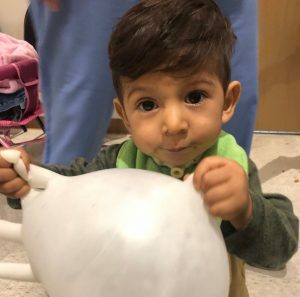 Imagine the desperation of a mother who hitchhiked with her 1-year-old son from their home three hours away to Hermosillo hoping to receive surgery for a cleft lip. Oscar is one of five children whose family lives on a salary of $50/week. Due to a last-minute family emergency, he and his mother missed the CSI screening day. Frantic, but undeterred, she left home with Oscar in her arms. She had no money, and only some juice, water and a small bag. That night the two of them slept outdoors and started hitchhiking toward Hermosillo the next morning. They were picked up by a kindhearted taxi driver took them as far as the bus station. From there another taxi driver brought them to the hospital. We were pleased to be able to put Oscar on our surgery schedule. When Iker arrived last year as a 5-month-old, he was severely malnourished due to feeding challenges as a result of his cleft palate. At that time he weighed about 3 pounds, small enough to fit in a shoebox. Too fragile for surgery at that time, his very survival was questioned by medical staff. At screening during the CSI trip last year he was admitted to a local hospital for care. The St. Andrew’s Children’s Clinic provided the financial and emotional support as he recovered. He arrived back this year for his CSI screening literally transformed, well nourished and ready for his cleft palate surgery. His mother is so very grateful! Three-year-old Hannah received the best gift ever! Her father promised her that after her cleft lip surgery he would buy her a brand new two-wheel bike. At the end of her bed when she awakened from anesthesia, she found a new pink and purple Peppa Pig bike. Hannah was out in the hallway riding the bike – which was decked out with shiny tassels and training wheels – three hours later under the very careful supervision of her mother and hospital staff. The generous and hospitable Hospital CIMA volunteers treated our team to a farewell fiesta last night. We enjoyed fabulous Mexican food fit for royalty, in the most lovely historical home in downtown Hermosillo. 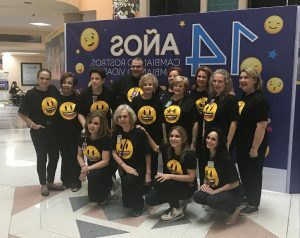 The evening was filled with music, karaoke and dancing late into the evening. Early this morning the team completed their final rounds, discharging the last 16 of our darling patients. Needless to say, there were smiles all around. Goodbye Hermosillo, until we see you again.